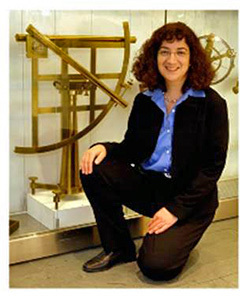 Dr. Sara J. Schechner (Harvard University) will be the recipient of the 2018 LeRoy E. Doggett Prize for Historical Astronomy. The AAS Historical Astronomy Division (HAD) awards the Doggett Prize biennially to an individual who has significantly influenced the field through a career-long effort. This award recognizes both Schechner's scholastic achievements and her service to HAD and to the study of astronomical history worldwide. Schechner is a prominent member of the AAS Historical Astronomy Division. She served as Vice Chair, Chair, and Past Chair during the period 2005-2011 and has served on numerous HAD committees. During the 1990s she was an especially valuable member of the AAS Centennial Committee and served as Chair of the Exhibit Subcommittee. As a founding member of the AAS Working Group for the Preservation of Astronomical Heritage (WGPAH), she has served as one of the group’s specialists in historic instruments since 2007. Her influence upon the history of astronomy is felt worldwide. She received her PhD at Harvard (supervised by Owen Gingerich and I. Bernard Cohen) in 1988, and since 2000 has been the university's David P. Wheatland Curator of the Collection of Historical Scientific Instruments. She is widely published; her two most recent volumes are Sundials and Time Finding Instruments of the Adler Planetarium, Volume I (Adler Planetarium, 2017) and Tangible Things: Making History Through Objects (Oxford University Press, 2015; co-authored with Laurel Ulrich, Ivan Gaskell, and Sarah Carter). She has prepared numerous exhibitions and received many awards, including the Great Exhibitions Prize from the British Society for the History of Science in 2014 and the Joseph H. Hazen Education Prize from the History of Science Society in 2008. The prize is a memorial to LeRoy Doggett (1941-1996), who was an active and highly regarded member of the Division and was serving as Secretary-Treasurer at the time of his untimely death from cancer. An expert in calendars, archaeoastronomy, and planetary theory, Doggett worked at the US Nautical Almanac Office from 1965 to 1996 and headed it from 1991 to 1996. Schechner will receive her award, which includes an honorarium and framed certificate, and give a prize lecture at the 231st AAS meeting in January 2018 in Washington, DC.